Although Christmas is only a few days away, it doesn't really feel like it here in San Francisco. Despite the last few days of pouring rain, the weather has been pretty constant with balmy 60-degree temperatures. My stockpile of wool sweaters, hats, and scarves remains stashed away in the closet. And because I'm a grinch who didn't bother buying any holiday decorations for my studio (which is much too small to fit a tree anyway! ), the only signs of Christmas in here are these cardboard cut-outs of fir trees that came free with a package from Anthropologie. That my cat immediately attempted to chew up, of course. Clearly, #apartmenthummingbirdhigh is in need of some holiday cheer. Thankfully, it was almost like my blogger friends could predict my BAH HUMBUG-ness all the way back in November and went ahead gave me an excuse to brighten things up around here: a marzipan party! Today, Alana, Beau, Betty, Lily, Molly, Steph and myself are posting recipes that use marzipan to get us all psyched for the upcoming holiday. Because in Europe, marzipan is often associated with Christmas and other holidays like Saint Nicolas' Eve (where folks seem to get marzipan pigs in their stockings — how cute is that?! ), but that's not so much the case here. And it's about time we changed that. 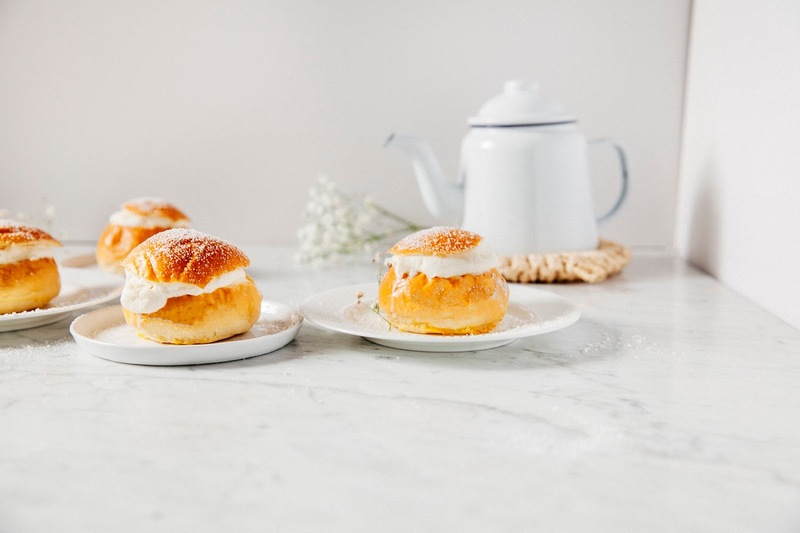 So for the party, I decided to stick with a European dish and make semlor; that is, sweet bread buns from Sweden filled with almond paste and whipped cream. 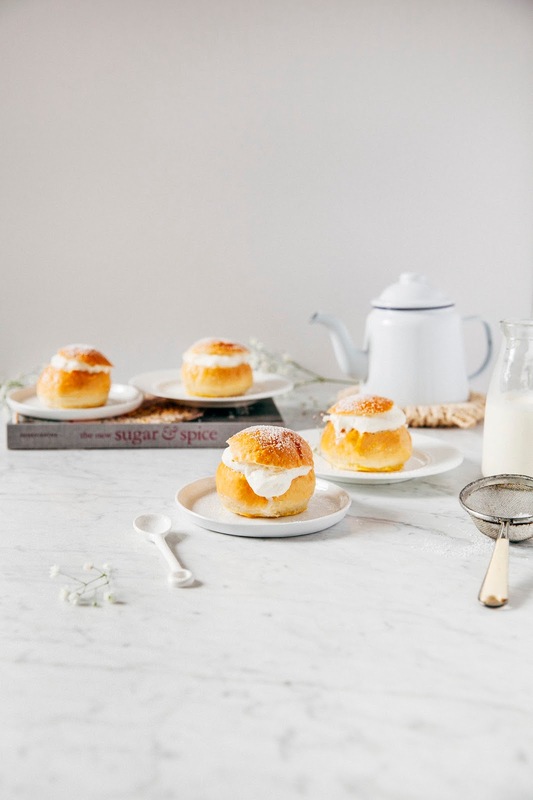 Semlor buns have been on my "To Bake" list ever since I first found out about them years ago on one of my favorite blogs, Call Me Cupcake. 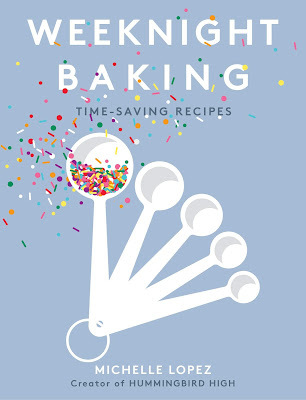 Unfortunately, because that "To Bake" list is perpetually growing (it's currently about four pages long, ugh), they became buried and ultimately forgotten as the list grew larger and larger. 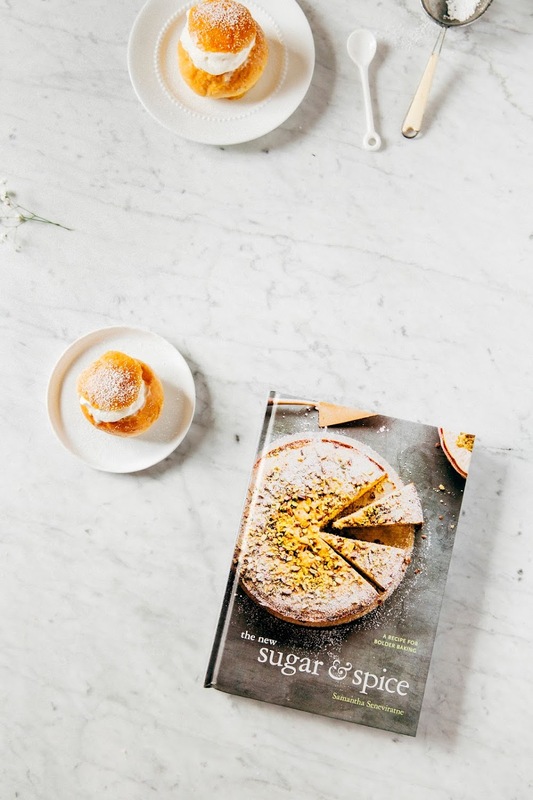 However, over the summer, Sam sent me her amazing and incredibly beautiful cookbook, The New Sugar & Spice. 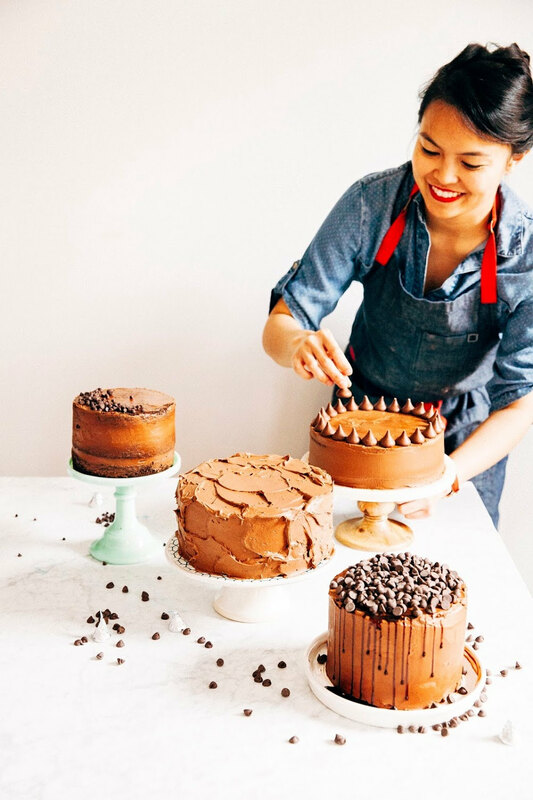 I had the pleasure of meeting Sam at the Saveur Awards Ceremony this past spring and can honestly say that she's one of the sweetest and most talented bakers I've ever met. It's a little embarrassing that it's taken me this long to cook from her cookbook, because upon receiving it, I've flipped through it an embarrassing number of times. And despite dog-earing almost every recipe in the book, I've found myself coming back over and over again to her recipe for semlor buns. 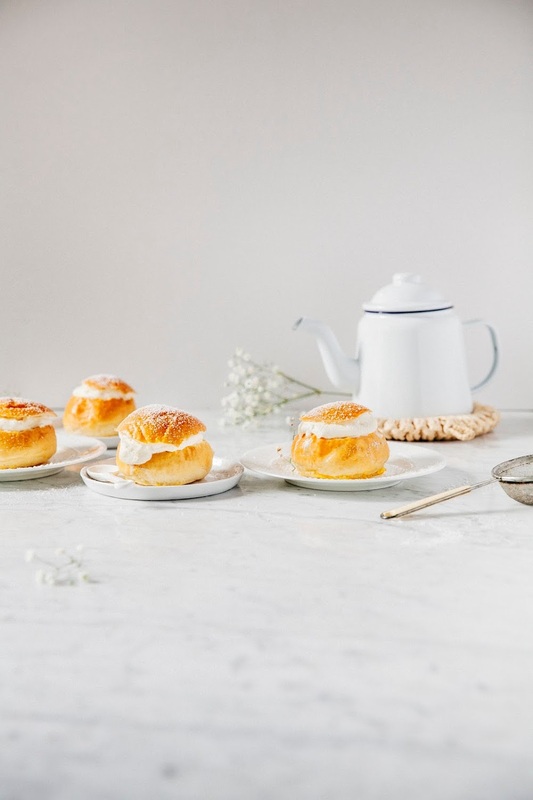 Sam's recipe is the first recipe for semlor buns that I've ever tried, and it did not disappoint — these buns are every bit as delightful and tasty as they look. The buns are light, buttery, and wonderfully spiced with fresh cardamom seeds. A bite of a bun fresh from thmynae oven was like taking a bite of a delicious pillow. And when decked out with the marzipan and whipped cream filling? Oh my GOD. It tastes the way Christmas SHOULD taste. Merry Christmas!!! And be sure to check out the other recipes for the marzipan party (kiki?)! The only alteration I made to Sam's recipe was that I used marzipan as opposed to the almond paste that she calls for in the filling. Be careful not to get the two confused — although both are made from almonds, they're actually pretty different from one another. Marzipan is smoother, sweeter, and easier to mold, while almond paste is not as sweet and far coarser than marzipan. Marzipan is often used to make candy, while almond paste is instead used in filling pies and cakes. Luckily the two are fairly interchangeable in this recipe, but that's not often the case for recipes like amaretti cookies and stollen. Pay attention to the ingredients list! 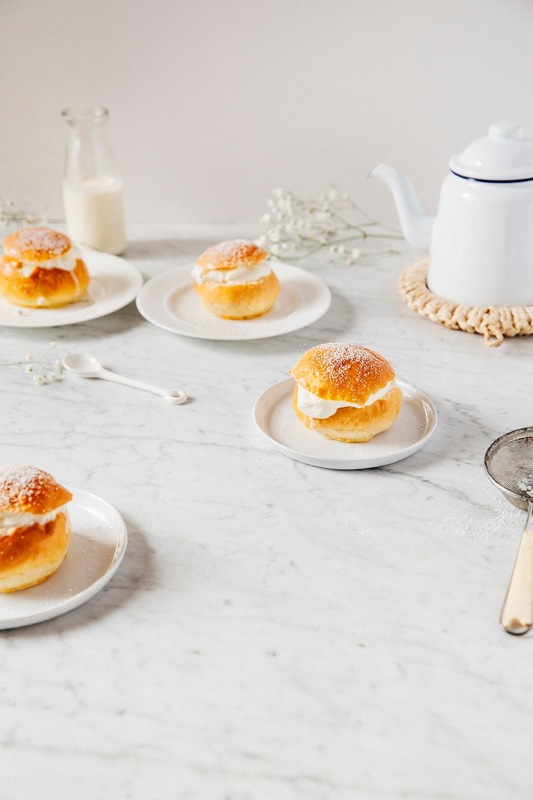 The semlor are best the day they're made, but you can make the buns a day ahead or so and rewarm them before serving. For the tastiest experience, it's best to cut and fill the buns with marzipan and cream JUST before serving. 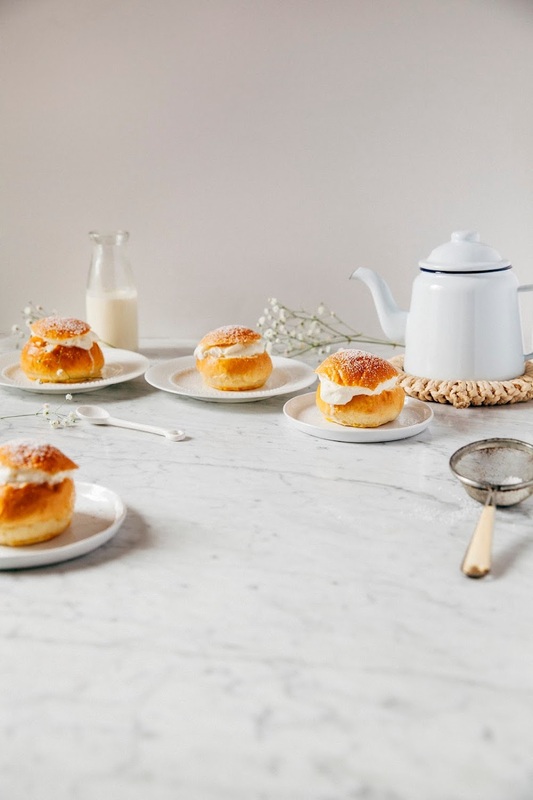 Also, according to Sam, you can also serve them the traditional "hetvägg" way, in which you set a bun in a bowl of warm milk and eat it with a spoon. Talk about living the life, guys. Let's all move to Sweden. To prepare the dough, bring 1 cup whole milk just to a boil over medium heat in a small pot. Watch closely to ensure that the milk doesn't boil over! Remove from heat and immediately add 6 tablespoons unsalted butter to the pot to melt. Once the butter has melted, transfer to the bowl of a freestanding electric mixer and let cool to 105 (F) to 110 (F) — you want the mixture to the point where it's warm to the touch, but not uncomfortably hot. With the mixer fitted with the paddle attachment, add 1/2 cup granulated sugar, 2 1/2 teaspoons active dry yeast, and 1 large, lightly beaten egg and mix on the mixer's lowest speed briefly until just combined. Add 3 cups all-purpose flour, 1 teaspoon crushed cardamom seeds, and 1 teaspoon kosher salt and mix on the mixer's lowest setting until just combined. When the ingredients have been mixed enough to form a sticky dough, switch the paddle attachment out with the dough hook attachment and knead the dough on low speed for around 6 to 8 minutes, or until smooth and elastic. If the dough looks too sticky, feel free to add up to 2 tablespoons of all-purpose flour — but resist to add any more than that; it's normal for the dough to be a little sticky. Use your hands to form the dough into a ball and transfer to a large, lightly greased bowl. Cover with plastic wrap and leave in a warm, draft-free spot until the dough has doubled in size — this could take 30 minutes or up to 2 hours, depending on the temperature. It's best to keep an eye on the dough rather than the clock. When the dough has doubled in size, line two baking sheets with parchment paper and set aside. Turn the dough out onto a very lightly floured surface and knead it a few times. Use a bench scraper or a serrated knife to divide the dough into 12 equal pieces, using your hands to roll each piece into a rough ball. Flatten each ball slightly and fold in thirds, like a letter. Then turn each piece over and reshape it into a ball, rolling each piece by forming a claw with your hand around the dough and moving it in a circle. Be sure to make the balls as neatly and tightly as you can — the nicer your balls, the nicer your buns will be. Divide the balls between the prepared baking sheets and cover loosely with plastic wrap. Place the sheets in a warm spot until the balls have doubled in size, about 1 hour. As the dough is rising for the second time, center two racks in the oven at the bottom third and upper third location of the oven and preheat to 375 (F). In a small bowl, whisk together 1 large egg yolk and 2 teaspoons water. Use a pastry brush to lightly brush the tops and sides of each dough ball with the egg mixture. Place one baking sheet in the upper-third rack, and the second sheet in the lower-third rack. Bake in the preheated oven until golden brown, 18 to 20 minutes, swapping the two trays' location about halfway through the baking time. After baking, transfer each baking sheet to wire racks to cool until just warm. Use a serrated knife to cut off the third top of each bun, and pull out some of the center of each bun to make room for the filling. The semlor are now ready to be filled! To prepare the marzipan filling, combine 1 1/2 cups marzipan and 1/2 cup whole milk in a food processor until smooth. Fill each bun with 2 tablespoons of the marzipan filling. Next, make the whipped cream by combining 1 1/2 cups cold heavy cream and 1 tablespoon confectioner's sugar in a freestanding electric mixer fitted with a whisk attachment. Whip on medium speed for a minute or two until the cream starts to form soft peaks. 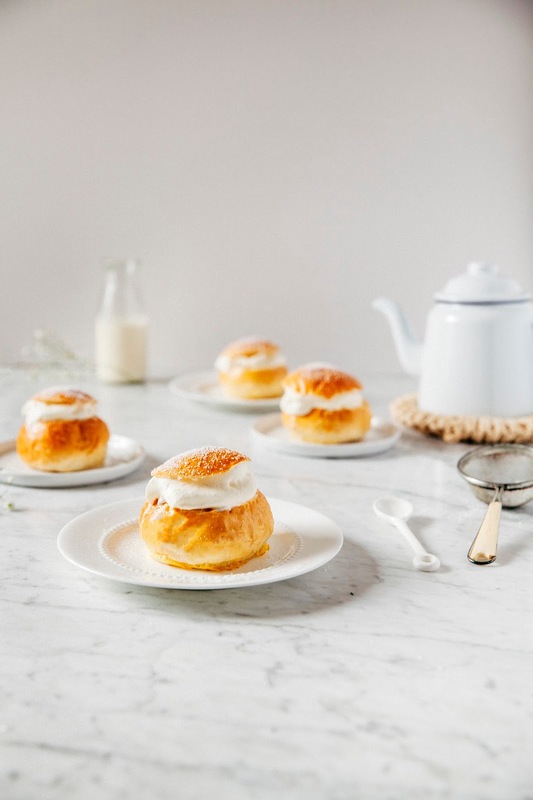 Use a cookie dough scoop to spoon a generous amount of whipped cream over the marzipan filling in each bun, and top the cream with the bun lids. Sprinkle each bun with confectioners' sugar and serve immediately.